Staff Correspondent: Several organisations of garment workers have rejected Tk 8,000 as minimum wage for readymade garment (RMG) workers and demanded Tk 16,000 as minimum wage. 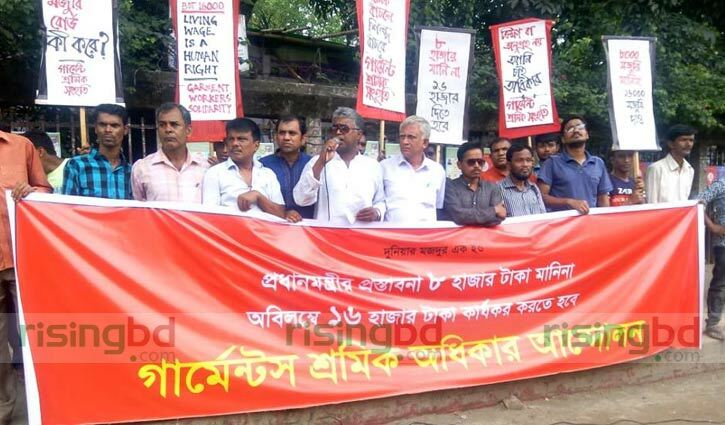 Hundred of garment workers staged a sit-in in front of the Jatiya Press Club on Friday and they also brought out a precession protesting the government decision. The workers’ leaders said they would announce tougher programmes if the government does not meet their demand soon. RMG workers have long been staging demanding fixation of their minimum wage in the country’s garment workers at Tk 16000.